Kārttikeya now took Indra as his charger in the form of a peacock; and his lance, the Vel sought the foe out in his hiding in the ocean. Surapatuma rose at last out of his island fortress 'Vîra-mahendram,' as a frightful and enchanted mango tree and attacked him. The lance pierced the tree and broke it in twain. The broken pieces instantly transformed themselves into a mighty peacock and a chanticleer (rooster). The former attacked Indra who was serving as the Lord's bearer. The asura had spurned his last chance for submission! Shanmukha's grace however prevailed. As an act of forgiveness, he took the peacock as his permanent charger (relieving Indra) and the chanticleer on his banner. The story goes that the two (cēvalum mayilum) live in His presence ever after. Shanmukha's mission was now fulfilled, and the Devas were freed. 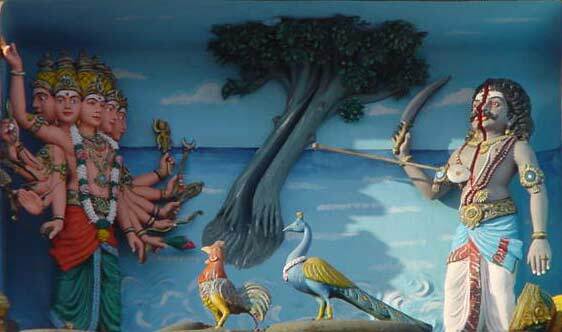 He turned again to Tiruchendur, halted and worshipped Śiva at the shrine Mayan had built for Him. "The events leading to the vanquishment of Surapatuma, with the moral significance of the expiation of sin are yearly celebrated by festivals and feasts in Tamil land in the month of Aippasi (October-November) ending on Skanda Shashti the sixth day of the waxing moon. On such occasions, the Kanda Purānam is read and expounded with solemnity; also at times in private houses such readings are deemed efficacious, apart from spiritual benefits, in warding off or alleviating disease and danger and bringing good fortune."